Prices online and ADgreek store are not always the same. Usually onlne prices are cheaper than prices for store. 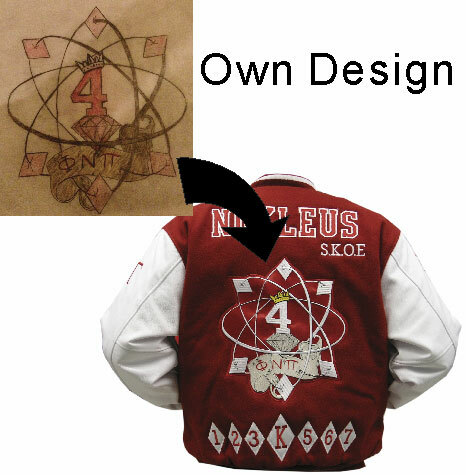 On our online designer, we have 4 different outline thickness. 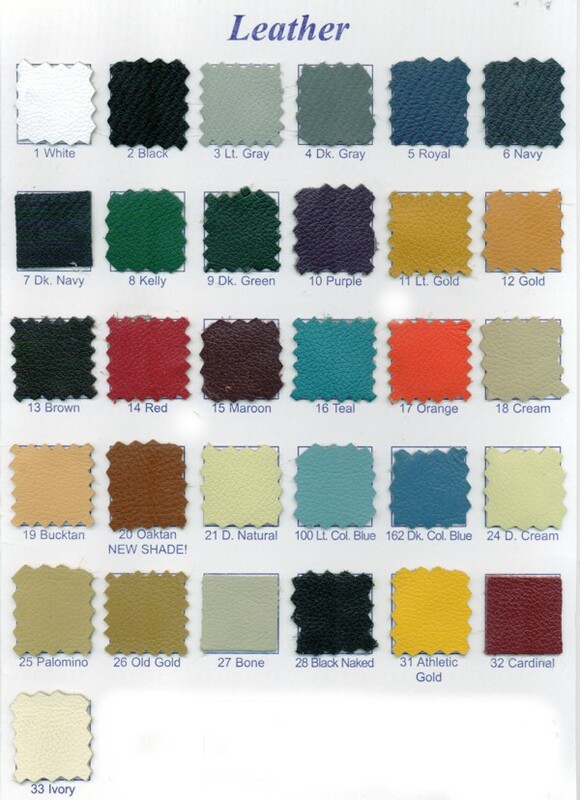 But it not actual thickness of Tackle Twill outline .It is just referenc of making outline color online. Thickness of text outline is just reference of actual lettering on garment. 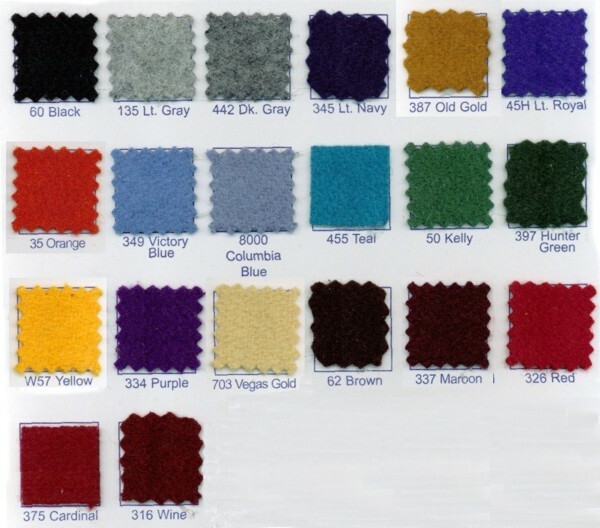 There are 2 type of stitching for tackle twill letters. 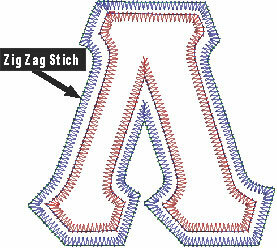 1) Zig-Zag Stitch - A zig zag stitch used to sew twill fabric onto a garment. 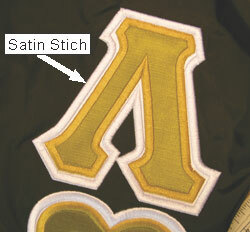 2) Satin Stich - A long, straight embroidery stitch worked closely parallel in rows to form a pattern that resembles satin. This type of stitch is also used in sewing twill fabrics.Stitch density(or stitch Count) is 5 times more than Zig Zag stitch. 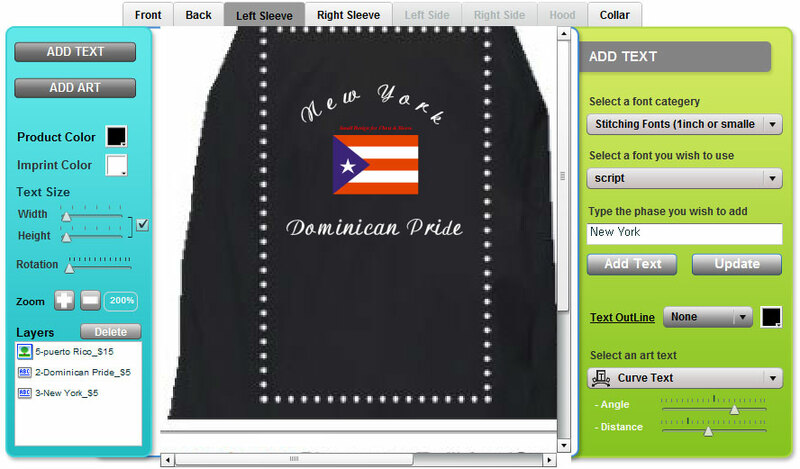 Your custom logo can be “digitized,” which is the process of duplicating your logo into an embroidery format. The cost of this process is based on the complexity of the design and is quoted job by job. Accepted formats for your artwork: COREL, ADOBE, JPEG, BITMAP, TIFF. (If artwork is vector based, please convert to curves. Any JPEG or BITMAP images must not be less than 200 DPI). Art charges may apply for substandard artwork. Please Note: Degitized artwork must NOT conflict with Copyright laws. Customers must prove they own any aplicable Copyrights for each logo. We have around 3,000 different cliparts in our system. Embroided clipart pricing depends on size and stitch count for each. Laser engraved (paddles, plaques etc.) and screen printed cliparts are one standard price each. 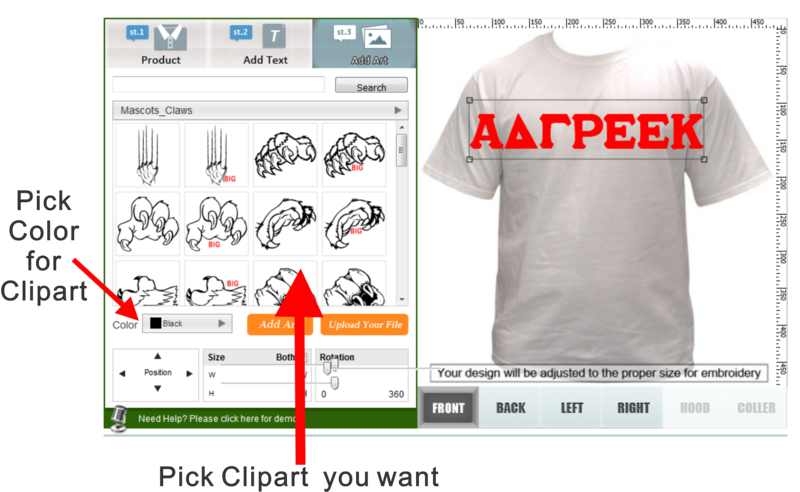 Clipart images are updated frequently. Embroidery is to stitch a decorative design on fabric with needle and thread of various colours. below is the actual sample of embroidery.Several different fonts are available. please check our online designer. Online design is just a reference of the actual design on garment. Stitching Fonts(1inch or smaller) 1inch or smaller than 1inch, Chest, we usually make 0.5inch~0.75inch. Stitching Fontsare not available 2color(with border Color). place; the edges of the appliqués are then zipzap stitched. 1)Cross Stitch(Zig-Zag Stitch) - A zig zag stitch used to sew twill fabric onto a garment. 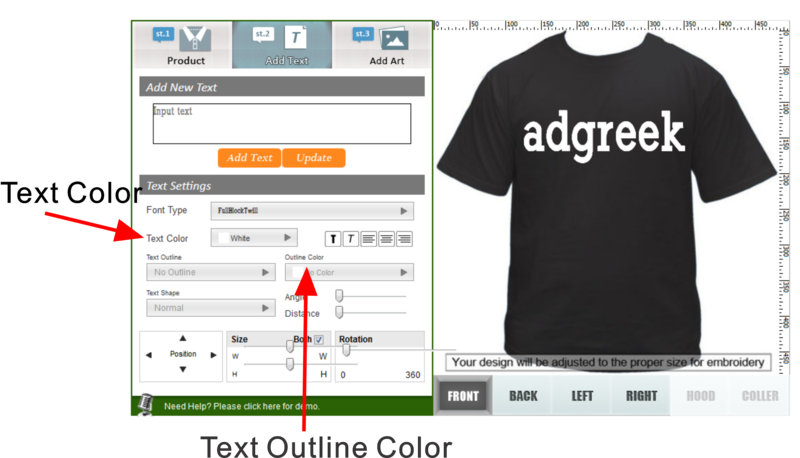 1)For lettering,Please click "ADD TEXT" and choose font.We have Tackle twill font(English & Greek) and Embroidery font. 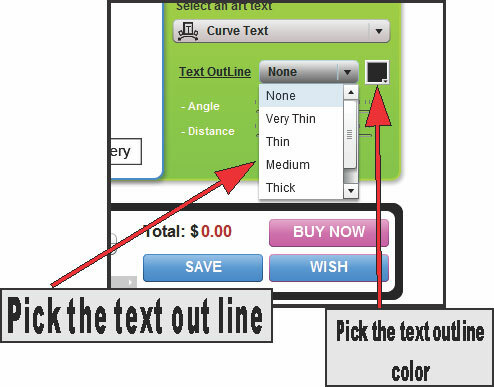 2)Type the text you want to use and click "ADD TEXT"
3)With your mouse move the letter where you want,choose the color you want from" IMPRINT COLOR"
4)To your text,type the text again and click "UPDATE"
5)To the text,click it with your mouse and hit key on your keyboard. Due to color rendering constraints on the internet, the website is unable to accurately render certain colors. Colors also look somewhat different depending on the settings of your computer monitor. The colors shown here are not exact.Please keep this in mind when ordering. 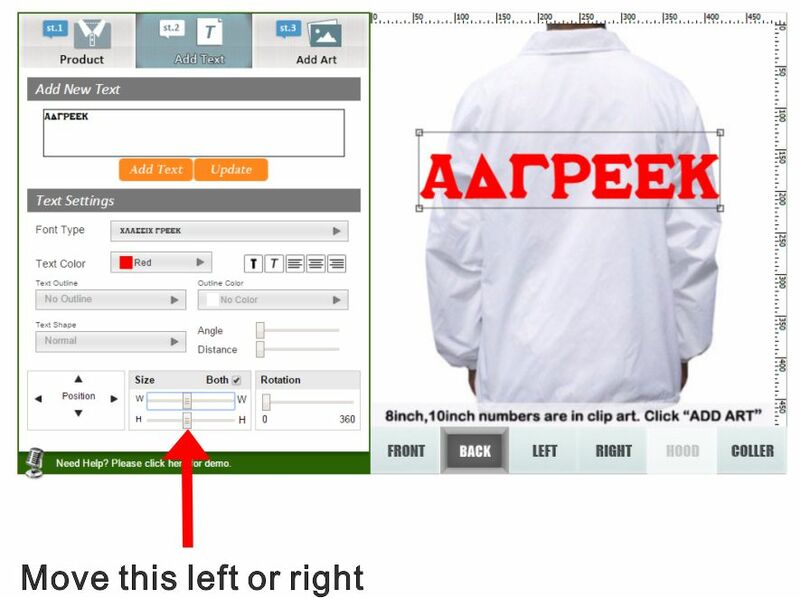 Online design is just reference of actual design on garment. We can not make it exactly same as customer made design online. Get a 5% group discount on group orders of 12 items and 10% for 24pcs.! All items in your order must be identical except for sizes, names, and numbers. 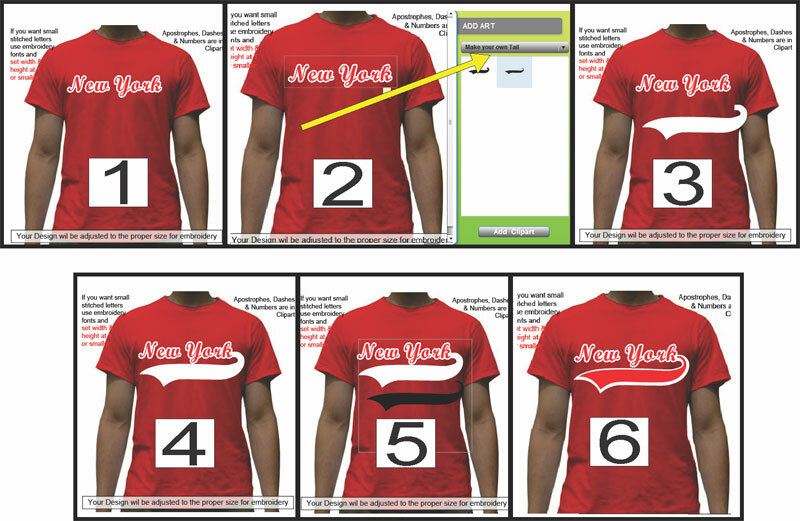 Design online the common information and choose sizes online and write indivisual names and numbers in other Instructions. Other instructions is in shipping cart. Just the object and hit the button on your keyboard. Any question? Please call us or email us. Some of our larger or heavier items (for example: paddles, plaques, etc.) will require additional shipping charges. We will let you know if additional shipping charges will need to be applied to your order. (This offer is only valid with any order made online and have the items shipped. This offer is only valid when the sum of only the letters amounts to $35 or more. Pick-up orders will NOT recieve the 10% discount. So if you want the word “GREEK” you would write GREEK. If it is greek alphabet, just type ,Sigma,Theta, like this. The best internet browser for our site is Google Chrome . Please use Google Chrome for our online design systems. June,July, August Our shop close 3 pm on Saturday. In order to change your order,You must use here. We will not accept any changes unless you use link. above we will not take them over the phone. You can make your own tail design on our online system. You can use Only twill font to make your own tail design. Please do not use stitching font because it doen not have border color(text outline). please check the picture below. Other instructions is the space you can descibe how you want, what color and ect.. There is limitations that you can design online,Please explain here the way you want. Our online designer, You can make size of letters. 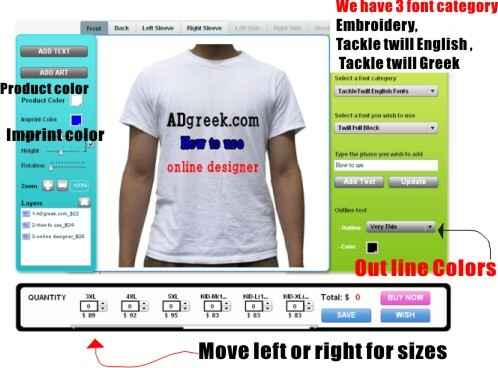 It is just a reference of the actual design on garment..
We have more than 3000clip art for greek section. 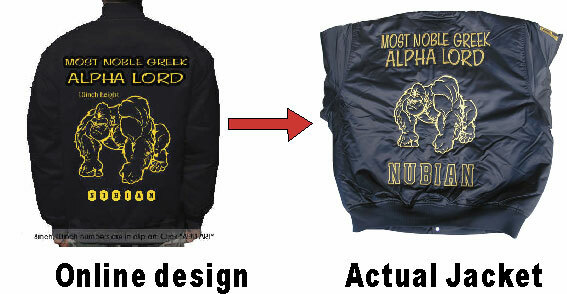 Size of lettering online is just a reference of the actual design on garment. a)on our online system, you can not size lettering(it is just reference). Greek letters on front, We usually make 4inch height, if you want 6inch height, you can make 6inch. 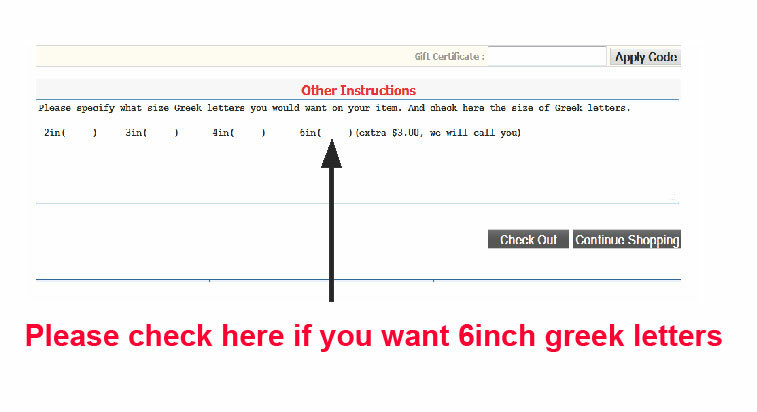 but you must tell us you want 6inch.You have to choose 6inch in "other instructions"
We usually make 2.75inch with border color(with text outline). Usually minimun size for letter is 2inch and upto 2.75inch. Numbers are up to 10inch. But If you want samller letters ,DO NOT choose tackle twill font(2inch or bigger) either greek or English font. 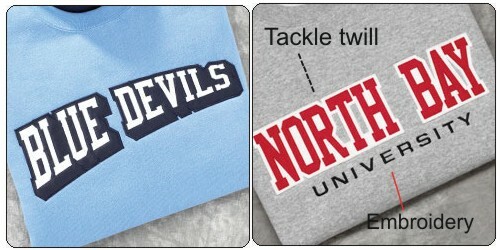 Tackle twill greek font and English font are not for samll size letters. 1) Please open Baseball Jersey you like to design(We have several different style). Please choose the background and change the color you want and next choose top design and change the color you want. If you want to add numbers,Please go to the clip art section. then pick number you want and put it on top of bolder number. Please use twill letters, its size is usually 2inch or little bigger than 2inch. 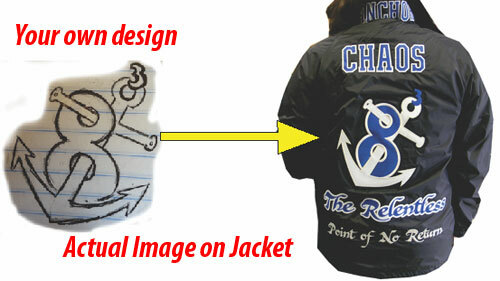 1) Go to Special Order Jacket section in the jacket catagory. 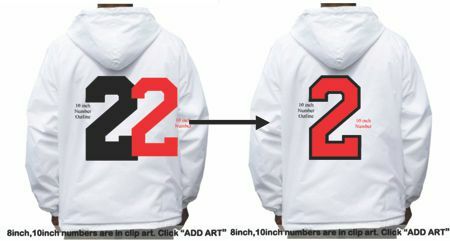 2) cliclk "Customize it" and black Jacket will be shown in online designer. 3)Click "ADD ART" button on upper left side of online designer and click "Custom made leather jacket"
We usually make any order from Clifonia and west coast & ship faster any order from Clifonia and west coast. Chest 32"-34" 34"-36" 38"-40" 42"-44" 46"-48" 50"-52" 54"-56" 58"-60"
Any kind of image is OK(your hand scatch, graphic) But we need high quality image(300 dpi or higher). Vector image is the best if you have.